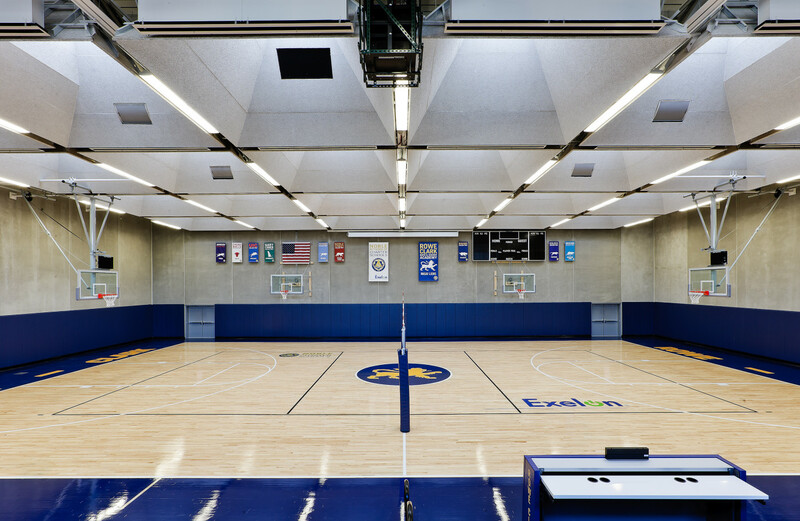 Exelon Gymnasium was built adjacent to the campus of the Rowe-Clark Math & Science Academy and is the first IHSA-compliant facility for the Noble Network of Charter Schools, a not-for-profit operator of charter high schools in the city of Chicago. 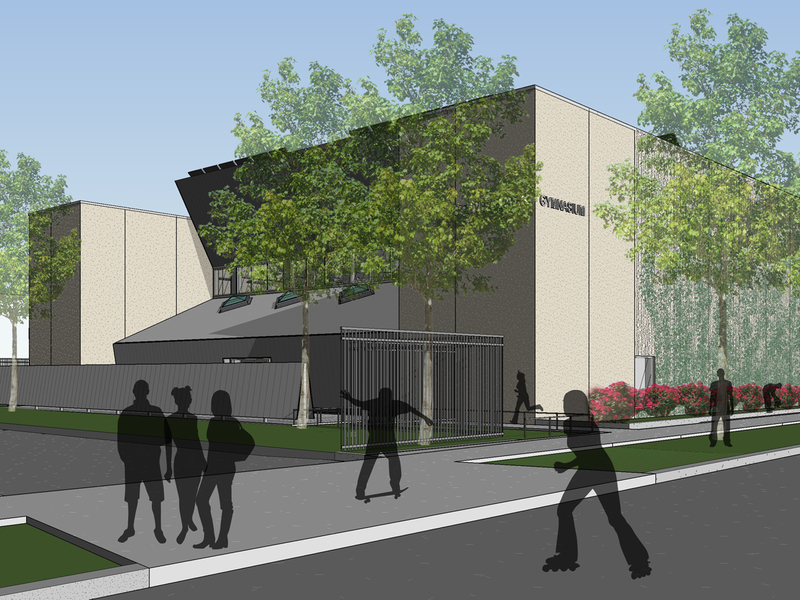 Built on abandoned lots acquired from the city, the precast concrete building is designed to house the school’s sports teams, physical education classes, Junior ROTC program, and the all-school “town hall” assemblies. 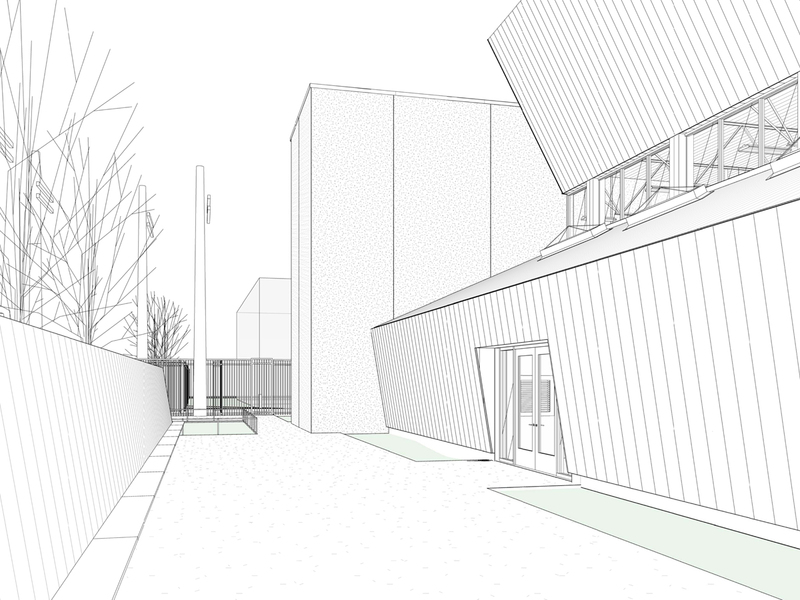 Built on a vacant lot in a Chicago neighborhood struggling with the effects of poverty and crime, the Exelon Gymnasium is changing the daily lives of the 590 students of the Rowe Clark Math and Science Academy campus of the Noble Network of Charter Schools. In addition to providing students with the network’s first high-school regulation basketball and volleyball courts, the space hosts monthly “Town Hall” assemblies which celebrate student leadership and academic achievement. 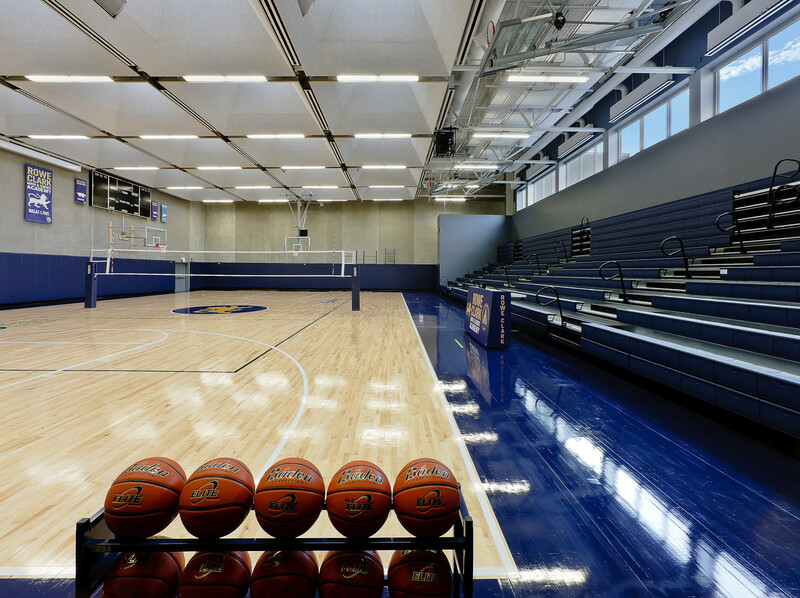 A single set of telescoping bleachers occupy one side, rather than a typical gymnasium where visitors and home teams sit on opposite sides of the court. 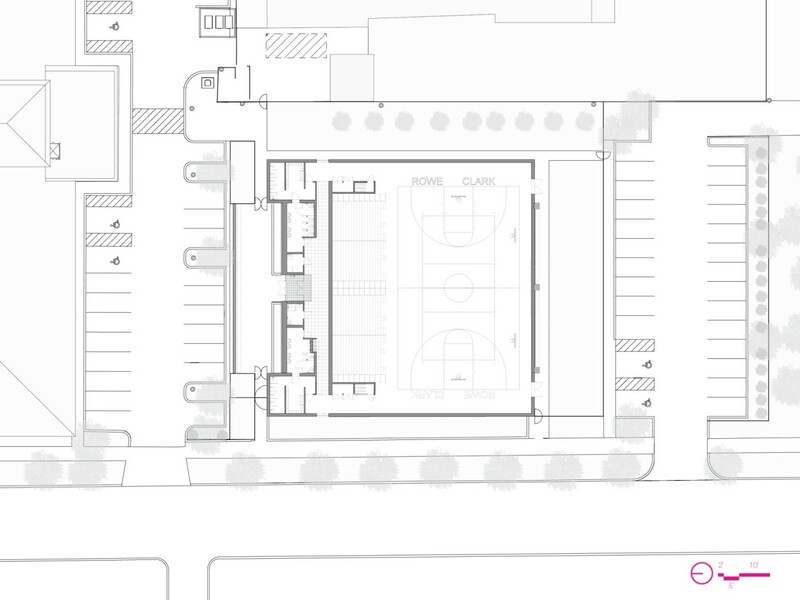 In basketball mode, the bleachers partially extend to the sideline to seat 400 visitors. In “Town Hall” assembly mode, the bleachers extend over the court to seat all 590 students along with guests. A 22-foot side projection screen drops along the opposite wall to create a de facto stage for video, music, and spoken word performances. 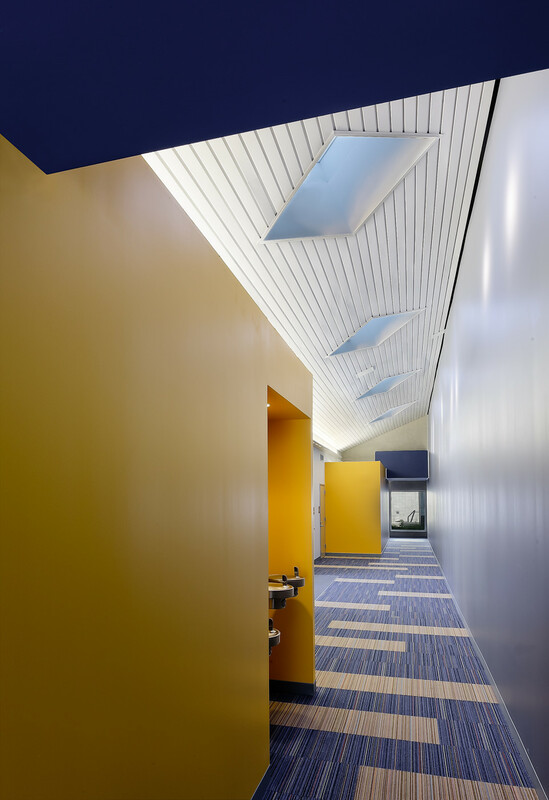 A typical school day requires no artificial lighting in the main space. 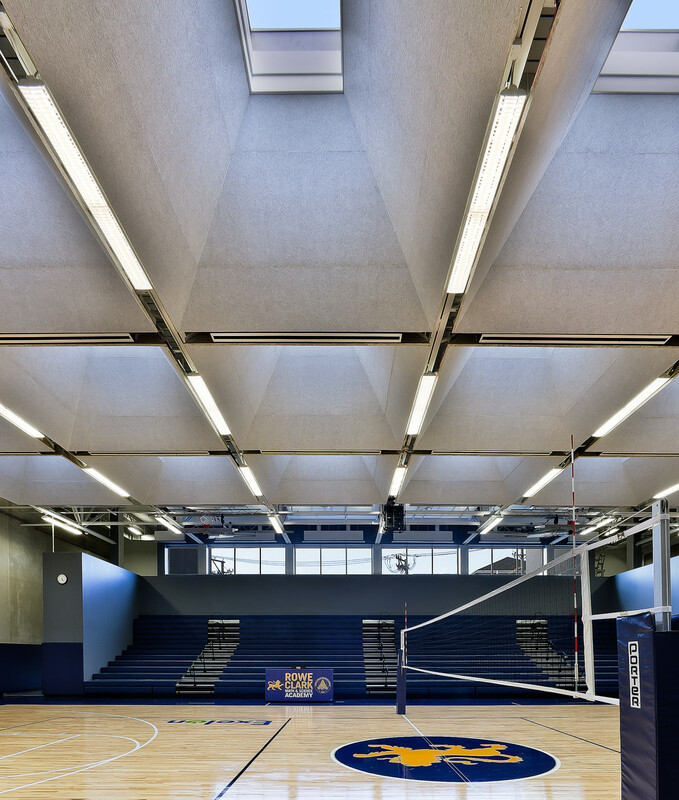 The ceiling over the court, comprised of twenty-four coffers crowned by a skylight, fills the gymnasium with natural light. 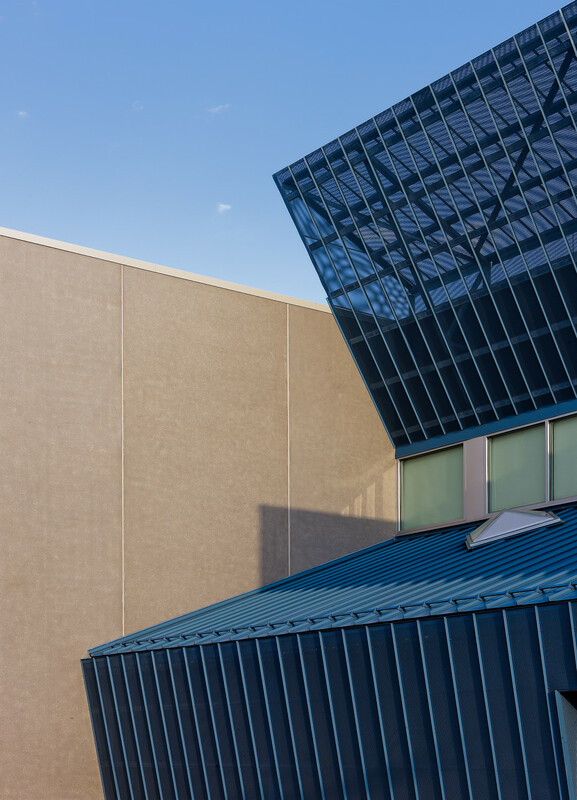 The light reflective coffers, fabricated with Tectum panels, amplify the daylight, absorb sound, and conceal the mechanical systems and audio speakers. 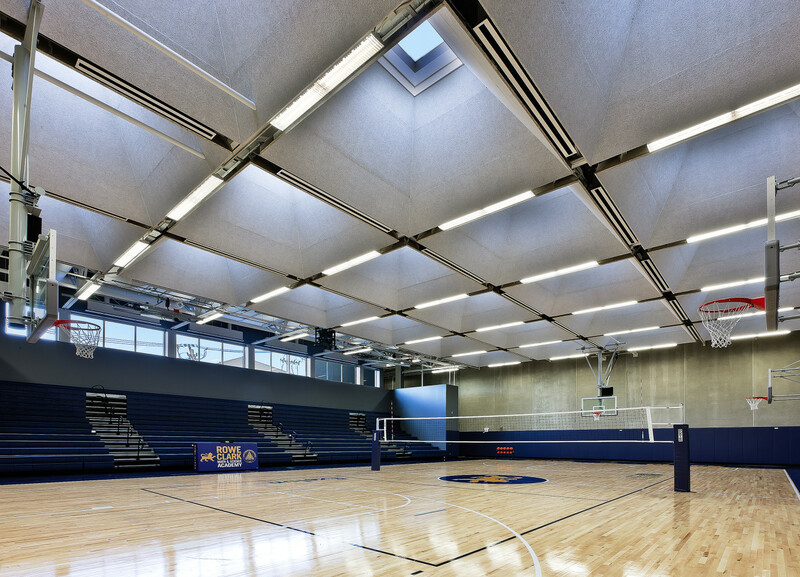 Each skylight has aerogel insulation that diffuses light and prevents shadows on the court. 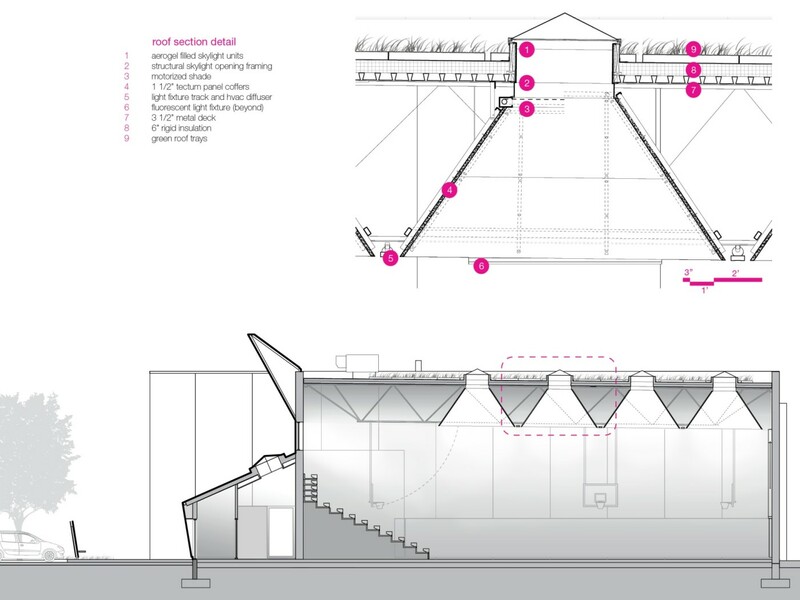 Full-scale mockups were created to test the coffer angles, the reflectivity of the panels, sightlines, and sound absorption. 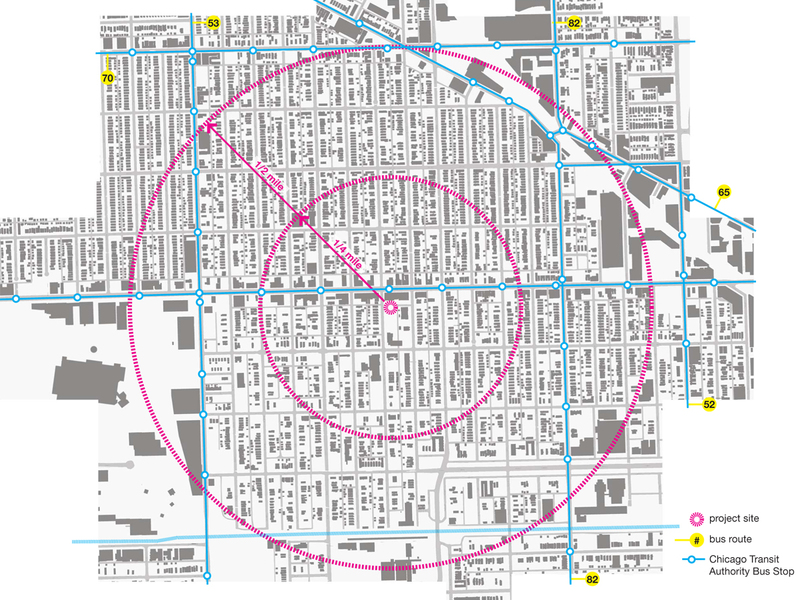 The infill project replaces a series of orphaned lots teeming with debris and foundations of buildings demolished long ago with a community asset that will be a source of pride for generations. 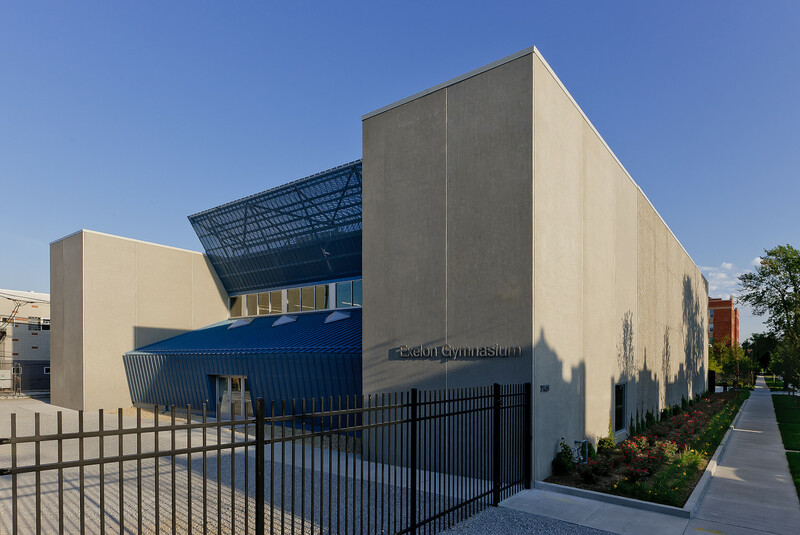 While the building provides a critical component of student life for Rowe Clark Math & Science Academy, it also completes the urban fabric of the entire city block, which had been piecemeal for decades.